Hi there! Today I’m featuring a historical fiction novel from best selling author Susan Vreeland. LISETTE’S LIST is an enchanting story of love, loss, sacrifice and redemption in France before during and after WW II. In 1937, young Lisette Roux and her husband, André, move from Paris to a village in Provence to care for André’s grandfather Pascal. Lisette regrets having to give up her dream of becoming a gallery apprentice and longs for the comforts and sophistication of Paris. But as she soon discovers, the hilltop town is rich with unexpected pleasures. Pascal once worked in the nearby ochre mines and later became a pigment salesman and frame maker; while selling his pigments in Paris, he befriended Pissarro and Cézanne, some of whose paintings he received in trade for his frames. Pascal begins to tutor Lisette in both art and life, allowing her to see his small collection of paintings and the Provençal landscape itself in a new light. Inspired by Pascal’s advice to “Do the important things first,” Lisette begins a list of vows to herself (#4. Learn what makes a painting great). When war breaks out, André goes off to the front, but not before hiding Pascal’s paintings to keep them from the Nazis’ reach. With German forces spreading across Europe, the sudden fall of Paris, and the rise of Vichy France, Lisette sets out to locate the paintings (#11. Find the paintings in my lifetime). Her search takes her through the stunning French countryside, where she befriends Marc and Bella Chagall, who are in hiding before their flight to America, and acquaints her with the land, her neighbors, and even herself in ways she never dreamed possible. Through joy and tragedy, occupation and liberation, small acts of kindness and great acts of courage, Lisette learns to forgive the past, to live robustly, and to love again. Lissette is a Parisienne, an orphan raised her whole life in Paris. She was educated and cultivated a great love of art. Moving to the rural southern Provance region of France to care for her husband’s ailing grandfather, Pascal, seems like a death sentence. Or, at the very least, a great punishment. Especially when she learns he has no indoor plumbing! This cultured girl soon takes to the country life–mostly out of necessity. And she very much loves her husband Andre, growing also to love Pascal. And, art. Pascal has wondrous tales of his communications with Cezanne and Pissarro, and beautiful paintings he earned in trade for the frames he built. The relationship that builds between Pascal and Lisette is a balm for her loss of family, and she grieves him terribly when he passes, promising to protect the valuable paintings that are his legacy. Then the war breaks out, and Andre hides the paintings and joins the battle, leaving Lisette to care for herself the best she can in her remote locale. If you have read COLD MOUNTAIN, you may have some inkling how difficult it would be for a woman of few skills to sustain herself in the absence of a man to tend the house, or protect her, in the midst of a war, and I felt an instant connection to Lisette in this regard. She is resilient, and formidable, despite her young age. She also turns society on its head, forcing her way into the “men’s world” by visiting the cafe during the aperitif hour to listen to the wireless radio document the war unfolding around her. When the Germans occupy her village, she comes under scrutiny for her knowledge of the artistic treasures–and is accosted for their whereabouts, but she cannot give them up. Andre is gone, and with them the secret of their hiding place. Through Lisette’s eyes we can experience the secondary effects of war. The suspicions of ones neighbors–who are collaborators? Who are resistance?–and we gain the sense of the sacrifices all civilians made. Lack of basic supplies, staple foods, rationing of everything. Lisette even cuts her hair, sending the clippings to become the insoles of boots for the soldiers, and donates the remainder of Pascal and Andre’s wardrobe for soldiers and refugees. When the war ends, Lisette knows she can return to Paris, but she stays in the country, fulfilling her promise to Pascal to care for the art–by finding it. Wherever Andre hid it, she must uncover the secret. See, thousands of paintings had been destroyed by the German forces, and those Pascal had—and Andre hid—mark important artistic transitions in French art history. They are valuable not only in themselves, but in the rich history they can document. This is important to Lisette, and becomes a part of her mission, and her way to cope with so much loss in her life. There is a bit of a love story that develops, as well. It is tentative and fragile as the players involved–the war has changed everyone, not just Lisette, and yet this change has brought new poignancy to love, and finding it anew. For the record, this book was recommended to me by a dear friend–and I’m so glad I found it. I really love to expand my reading, and this this quiet, period tale almost read like a movie script. I could–throughout–feel the chilling winds of the mistral, sense the fear and loneliness of Lisette, not only when Andre left her to go to war, but (spoiler warning) more so when he didn’t return. This story is as beautiful as the art it describes. I felt transported to southern France through Lisette’s frank point-of-view, and vivid descriptions. In experiencing Lisette and Pascal and even Andre’s love of art and passion for paintings in this book, I really lamented the loss of so much cultural teaching in our schools today. My children will never understand the names of these artists–nor the evocative nature of art–unless I teach them myself, and I am woefully unprepared for such a challenge having spent very little of my own youth learning about art. Still, I feel moved to learn, and share, and to ‘live in a painting,’ as Lisette put on her list of needs and hungers–the list which gave her the courage to go on when’s he disappointments of her life almost crushed her spirit. If you like historical fiction, this book will not disappoint. Interested? You can find LISETTE’S LIST on Goodreads, Amazon and Barnes & Noble. I snatched an advanced review copy off NetGalley. 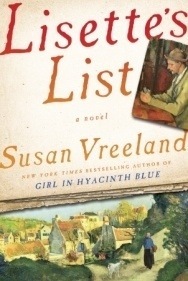 From Susan Vreeland, bestselling author of such acclaimed novels as Girl in Hyacinth Blue, Luncheon of the Boating Party, and Clara and Mr. Tiffany, comes a richly imagined story of a woman’s awakening in the south of Vichy France—to the power of art, to the beauty of provincial life, and to love in the midst of war. Susan Vreeland is an internationally renowned best-selling author and four-time winner of the Theodor Geisel Award for Fiction, the San Diego Book Award’s highest honor. She is known for writing historical fiction on art-related themes, including Girl in Hyacinth Blue, The Passion of Artemisia, Luncheon of the Boating Party, and Clara and Mr. Tiffany. Her books have been translated into 26 languages. She lives in San Diego, California. You can catch up with Susan online at her website, Goodreads, and Facebook.